You can’t road trip without a vehicle. Amy Ruiz Fritz June 21, 2013 June 21, 2013 1 Comment on You can’t road trip without a vehicle. This spring, I went on the road trip of a lifetime. I packed up my 10 year old car, my new boyfriend, as much stuff as would fit in said vehicle and moved my life to Minnesota from California. Sadly, it was not the breezy trip along the freeway I had imagined. Through a blizzard in Wyoming, I worried that my car would survive the freezing temperatures. I worried that my car would have enough oil to make it to the next patch of civilization between stretches of prairie in South Dakota. I worried that my car would make the climb through the mountains in Utah. Sadly, I shouldn’t have been worrying about such things, but my current car has a record of being unreliable. Road trips are meant to be enjoyed. Each year millions of people hop in their vehicles and wander across the highways that stretch across this great land. Seeing sites they will tell their friends about or share on various forms of social media. I was on a road trip that marked a turning point in my life. I wanted to enjoy each moment. Relish each sense…the sights, the sounds, the smells… Don’t you love the new car smell? I know I do. Somewhere on I-90, I decided a new car is on the list of things I need in my new life. I got a new job. I’m looking for a new place to live with my boyfriend (we need more space for visitors and the rest of my stuff). To complete the circle, I need a new car. Something that will be able to endure the harsh Minnesota winters and not leave me stranded on some snow covered highway. 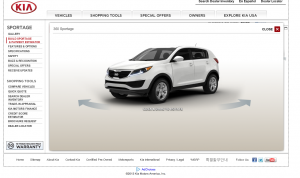 I have been researching Kia and they seem like an interesting brand. Specifically, I’ve been looking at the Sportage. I want a bigger car with a small car feel. I want more room for my passengers to feel comfortable, but I don’t want to drive around a party bus either. The Sportage seems like a the kind of small SUV/crossover I want. Kia has a pretty good warranty (5 years, 60,000 miles) and J.D. Power rated the Sportage four out of five in initial quality overall. Now the question is…do I get a new car before I find a new place to live or wait until my new address is settled and then find new wheels for my next road trip? I guess we’ll see where the universe (and the road) takes me. Home Hunting: What’s important to you? Want something “free” for your birthday? I’d suggest a Hyundai Santa Fe. We love ours and the warranty is awesome! Haven’t measured it up against the Kia, but it is worth a look.